On the Hot Toys Facebook Page, they have announced the acquisition of some new licenses. 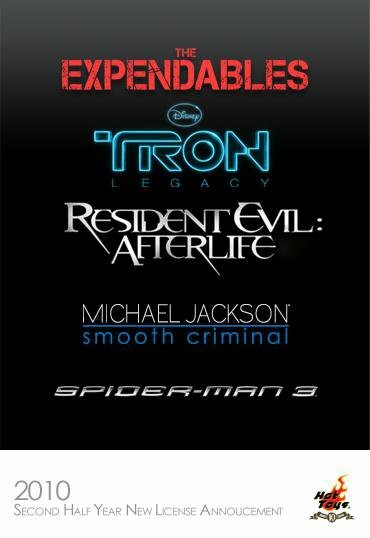 The new licenses are The Expendables, Tron Legacy, Resident Evil: Afterlife, Michael Jackson: Smooth Criminal, and Spider-Man 3. They promise even more announcements soon. Stay tuned to ToyArk as we will be following these figures closely. 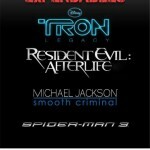 The Tron: Legacy figures from Hot Toys will be my first Hot Toys figures. I would love to hear your thoughts once you get 'em, Joe. Never owned a Hot Toys figure either, so I'm real curious. A friend of mine buys all of their Movie Masterpiece figures. I've been lucky enough to mess with their Dark Knight and their Joker. Those two were just awesome. Those two figures were the first time in a long time that I got that excited feeling from toying around with action figures. The quality on them is top notch and they have a nice bit of weight to them, making them super sturdy. I haven't seen the Iron Man figures in person, though they are the ones that I have been tempted the most by until this announcement. Speaking of Resident Evil: Afterlife, I'd love to see a line of 3 3/4-inch Resident Evil figures. Well if Hot Toys will now be doing work on Tron, it looks like I may finally own some Hot Toys. Ugh... I must avoid the temptation... To... Buy... Jeff Bridges figure...! I sold my Battle Damaged Ironman Mark III figure, not because it wasn't cool (on the contrary it was pretty sweet) but because when I saw that they were releasing the Predators Berserker I had to jump on it, I only own the Dark Knight Batman DX02 right now, but I can say that Hot Toys is second to none on the market with their 1/6 figures. The sculpts get better and better every generation, however its the DX figure line that makes the standard masterpiece line feel....lacking in the accessories department. I would love to see the P.E.R.S. make its way into every MMS figure but that would be asking for too much.